The Dreieich- Plaza is a complex of office buildings on the outskirts of the community of Dreieich, which belongs to the so-called affluent suburbs of Frankfurt/Main. The project consists of two free-standing buildings of similar kind. They are divided by a common access road to a large parking area. 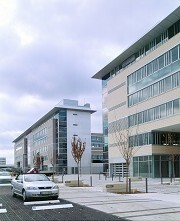 The project's main contractor was the Frankfurt branch of Ed. Züblin AG. The dry constructions were done by R&M Ausbau Frankfurt GmbH. 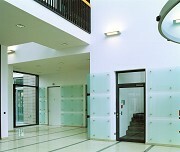 A part of this was the realization of the interior design of the left building's entrance hall, the walls of which were to be faced with glass elements. It was my task to provide the planning service for R&M, therefore I had to invent a suitable construction and an adequate plan of the details. I was also responsible for the tendering procedure and the monitoring of its on-site realization. We used modified glazing fixtures made by Pauli+Sohn, which were installed onto special rendering carrier plates. 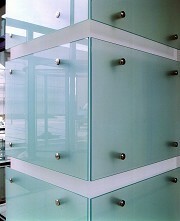 The used glass elements were sand streamed and pre-drilled panes made of laminated safety glass with a thickness of 10 mm.